← A trip to Solexx – make a day of it, even a weekend! To overcome that problem, she keeps her pigs in the center of the greenhouse. She fastened boards on the inside of the inner posts and used an electric fence to keep them from tearing everything down. Venting is also really important for release the “waste” gasses. She also recommends straw bedding. Raising the pigs in the greenhouse works very well for her. The pigs and the compost keep the greenhouse warm enough to plant through the winter and they help with the air flow. She plants over their heads and around the outside of their pen. So pigs, compost and plants are a great combination! For more information, call Glenda at 1-877-476-8399 or Gwen at 715-539-9740. Glenda Rueger Payne is the Dealer Sales Manager for Adaptive Plastics, Inc. Glenda brings more than fifteen years of sales and marketing experience to the function of developing and growing the national dealer wholesale program. Her background includes formal training at Penn Valley Community College and the University of Missouri at Kansas City as an English/Communications major and several years as an entrepreneur. Her natural enthusiasm and outgoing personality were honed into a strong professionalism by her varied career pursuits. Each of her experiences from her early days as a professional magician’s assistant working on cruise ships, then as a professional track reporter for the Salt Lake Valley Racing Association to several years of owning her own successful publishing business has helped her develop excellent people skills and business savvy. This has contributed to her ability to create strong relationships with the dealers built upon excellent customer service and inspiring enthusiasm for the Solexx™ product. The result has been increased sales due not only to bringing new dealers on board, but to growing loyalty and trust ensuring repeat business from the existing dealers as well. Glenda is an avid "urban gardener." Every square foot of possible space has been converted into raised beds for growing food, herbs and edible flowers. 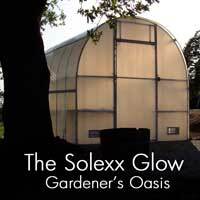 She is also the proud owner of a Solexx™ Harvester greenhouse and one custom-built Solexx™ covered greenhouse. She has found many other ways to incorporate Solexx™ into her home. This entry was posted in Greenhouses and tagged Solexx winter greenhouse. Bookmark the permalink.